Service Area: Robbinsdale School District area and surrounding communities. 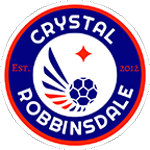 Our mission at CRYSTAL ROBBINSDALE UNITED is to provide children the opportunity to participate in a sports program geared towards the player. We believe that, regardless of experience, skill, or family income, all kids who want to, should have the chance to participate. We believe that kids shouldn't be forced to choose one activity and strive to provide a program with a time commitment that allows kids to explore other interests. Our players learn soccer techniques and skills, at age appropriate levels, ensuring that players have fun, grow in their athleticism, and have solid fundamentals as they progress through our program. Through soccer, kids will learn teamwork and sportsmanship, as well as the importance of health and exercise, all valuable well beyond the youth soccer pitch.